Starting from 1999, Ukrainians officially celebrate the Day of Unity on 22 January, marking the anniversary of the unification of eastern and western Ukraine on this day in 1919. The Unification Act (Akt Zluky) between the UNR (Ukrainian People’s Republic) and ZUNR (Western Ukrainian People’s Republic) was proclaimed in Kyiv at St. Sophia Square back then, 100 years ago. This finalized a long-awaited reunion of Ukrainians who had for several centuries been divided between the Austro-Hungarian and Russian empires and fought against each other as part of their armies. Alas, the dream of independent statehood for a united Ukraine was short-lived then. In memory of that event, on its 71st anniversary, amid rising national-liberation movements of the collapsing Soviet Union, on 21 January 1990, more than 450,000 of Ukrainians formed the first human chain symbolically uniting the cities of Kyiv, Ivano-Frankivsk, and Lviv. The memorable date got an official status in 1999, when then-president of Ukraine Leonid Kuchma signed a decree proclaiming the Unification Day of Ukraine a state holiday, celebrated on 22 January. However, there is no day off. Festivities and official ceremonies took place in Ukraine on the occasion of the Day of Unity today. In Kyiv, the head of the state and other officials laid flowers to the monuments to 19th-century Ukrainian poet Taras Shevchenko and UNR statesman Mykhailo Hrushevsky. The first couple paid tribute to the memory of Mikhail Zhiznevsky and Serhii Nihoyan, who were killed on the Unity Day amid the Revolution of Dignity in 2014. The Unity Day celebrations took place on the St. Sofia Square in Kyiv, where the Unification Act between UNR and ZUNR was proclaimed 100 years ago. Ukrainians formed a human chain across the Dnipro River on Kyiv’s Paton Bridge to symbolically unite Right-Bank Ukraine and Left-Bank Ukraine – historical and territorial names for parts of modern Ukraine on the right (western) and left (eastern) banks of the Dnipro River. So what happened a century ago? One important diplomatic action of UNR was signing the Brest Agreement in February 1918 with the countries of Quadruple Alliance, which defined UNR as an independent state. It was also recognized by Romania. The UNR existed on Ukrainian territory until 1920, when the UNR government went into exile. 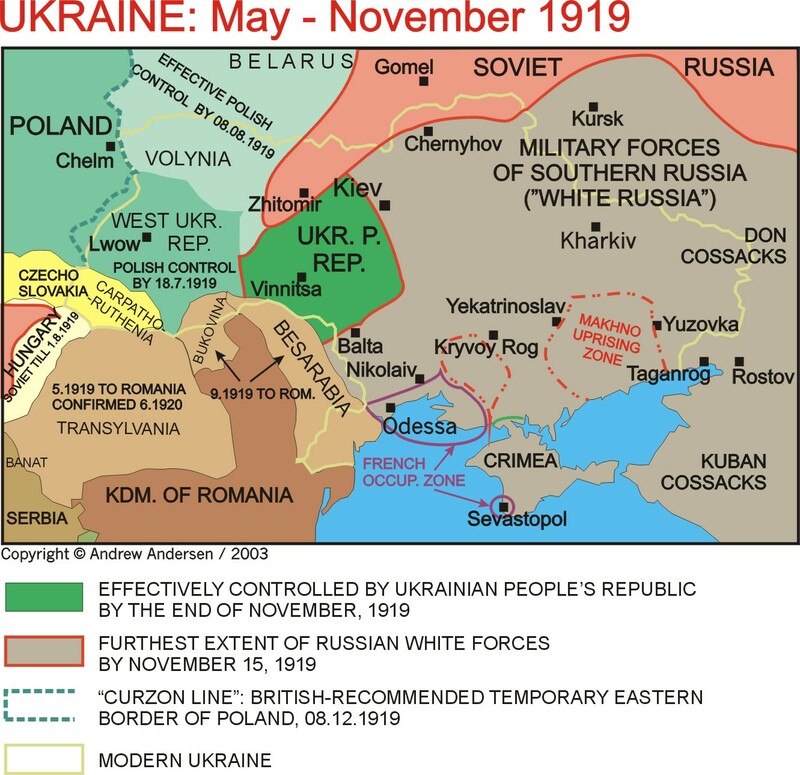 The military forces of the Republic fought in the Ukrainian territory until 1921. The state fell to the Russian invasion and was officially incorporated in the USSR in 1922 as one of its founding members, the Ukrainian Soviet Socialist Republic. The Ukrainian government-in-exile existed until Ukraine re-gained independence in 1991. The last President of the Ukrainian People’s Republic in exile, Mykola Plaviuk, handed over his presidential powers to Leonid Kravchuk, the first president of independent Ukraine. 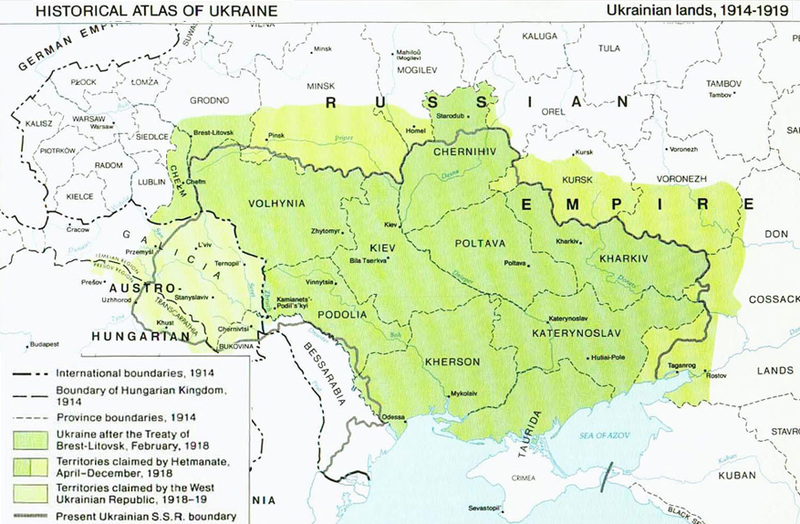 A large part of the territories of modern Ukraine, in particular, the regions of eastern Galicia, Bukovyna and Transcarpathia, were part of the Austro-Hungarian Empire which ceased to exist in October 1918 following its defeat in the First World War. Like other nations of the Empire, Western Ukrainians started creating their own state. On 18 October 1918, in Lviv at the meeting of all Ukrainian deputies of Austrian Parliament, Ukrainian members of Galicia and Bukovyna Seims, representatives of the parties of Galicia and Bukovyna, clergy and students created the Ukrainian National Rada (a Council) which became a political representative body of Ukrainian people in Austro-Hungarian Empire. A Ukrainian government took power on 1 November 1918 in Galicia, days later in Bukovyna and in Transcarpathia. The National Rada established the Ukrainian nation-state of the Western Ukrainian National Republic (ZUNR) on 9 November 1918 amid the Polish–Ukrainian War. 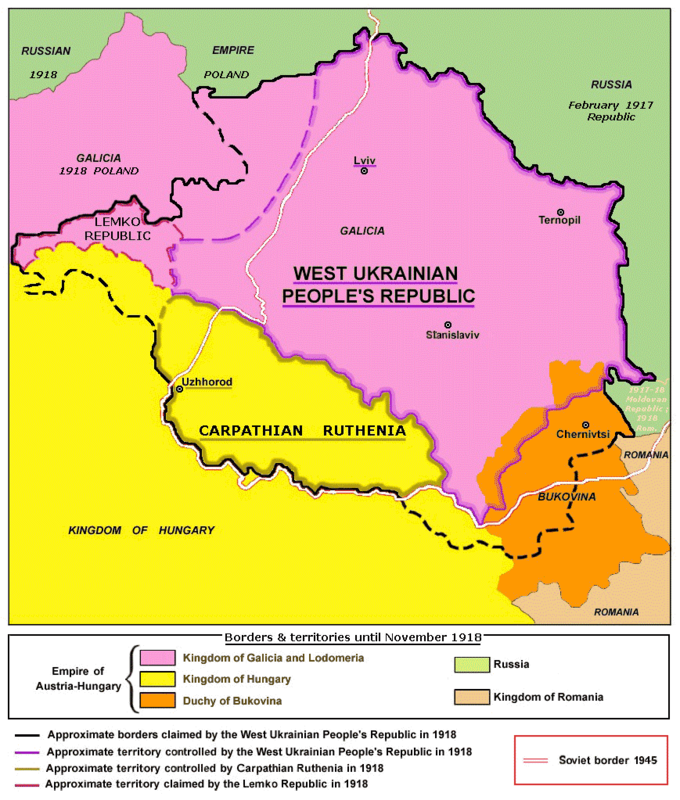 The Western Ukrainian National Republic lasted just several months until July 1919. The preliminary agreement between ZUNR and UNR to unite western Ukraine with the rest of the country was concluded on 1 December and on 22 January 1919 the act was signed in Kyiv. The act was mostly symbolic since both governments still retained their own separate armies and administrations, and the union has never been implemented because ZUNR was invaded by Poland and later by Romania, and UNR by Soviet Russia, thus both Ukrainian states ceased to exist. The territories of the former ZUNR were annexed by the USSR in 1939-1944 and appended to the Ukrainian Soviet Socialist Republic. Thus at the moment when Ukraine proclaimed its independence in 1991, most of the territories of UNR and ZUNR were already incorporated in Ukraine.